Henning Olsrud, born in 1986, is the first athlete from Norway who has won the IUTA World Cup. He finished four races in 2018 and was always on the podium. 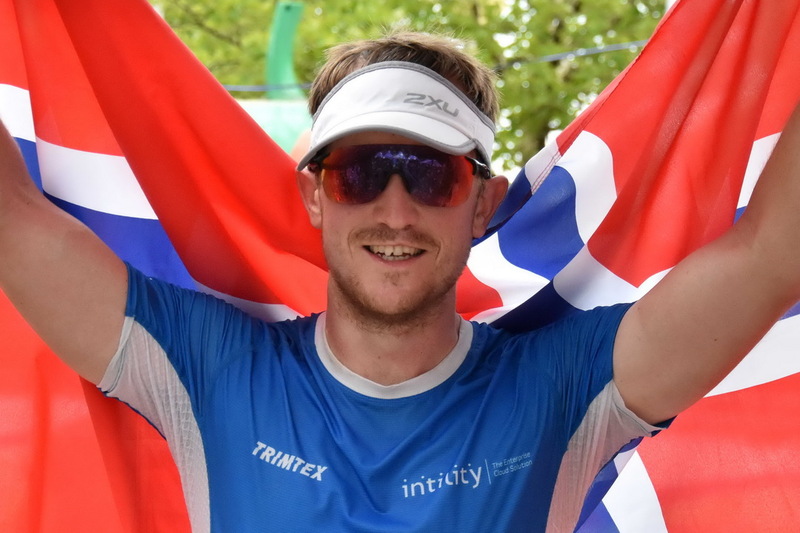 Right at the beginning of season Henning was able to win the Double Anvil in Florida and finished with the second best time ever at the Quintuple Day in Switzerland. We talked with him about his achievements in the past year. Congratulations on winning the IUTA World Cup 2018. What does this win mean to you? Thank you! It means a lot being able to be consistent throughout the year and the world cup itself has been a distant goal since learning about it as I first heard and read about ultra triathlons. Did you take into account a possible victory in your season planning or did that only arise during the year? No, not when planning the season but when I saw that I was able to compete in four events I was hoping that I would be able to pull off good enough results to be able to compete for the overall victory. How did you prepare for the last season? How do you train in Norway with the long cold winters? Was there a positive decisive experience during the last year or a perfect race? There’s no such a thing as a perfect race and I’m usually quite fast finding things that could, and should, have been done better and in these races they are usually easy to find due to the total distance. That being said my overall performance at the Quintuple in Buchs was probably the best during the season being able to keep consistent times across the five days including sub 3:30 marathons on four out of five days. In 2015 you finished your first ultra triathlon, the Triple UT in Lensahn on a great second place. Until the 2018 season, you have competed in "only" four ultra triathlons and now you did four in a year: How did you perceive the additional burden? For natural reasons I ended up doing less training and more competitions leaving my total hours of activity close to the same as the previous years. Except from the time between the Triple in Lensahn and the Quintuple in Buchs I think I had enough time between the events to recover fully in time for the next event. I think those two things made me able to go through the year without any major injuries which helps a lot in preparations as well. Last season, you have finished two continuous and two day ultra triathlons and have been on the podium every time. Which do you prefer and why? Which distance do you prefer? I don’t really have a preferred distance but for the moment it seems I’m more competitive during the one per day events, so I guess that’s why I picked that format when able to choose last season. During the one per days I remember thinking it would have been great to be able to finish faster if I moved quickly. I plan to try the continuous versions (Quintuple and Deca) later to see if that’s actually better or not. However, I would like to add that since my first Ultra Triathlon, the Triple in Lensahn, I have an additional incentive to compete in a Triple. It's just long enough and a brutal race without having sleep management be an actual part of the race strategy – it’s just trying to move as fast as possible until you cross the finish line. There’s still a lot to improve to be able to get a world record, as all of them are at a high level now. I have been improving steadily year by year and I hope I’ll continue to improve and we’ll see where that ends up. Current I’ve registered for the Double in Emsdetten only. My plan is to sign up for a second race this year, but it’s very unsure.